The bill for this year’s Maverick Festival, held at Easton Farm Park across the first weekend of July, is bigger than ever and packed full of Americana, roots and alt-country acts from both sides of the Atlantic.This great article featured in the East Anglian Daily Times gives the low down on the whole event. This will be the second year organisers have teamed up with the Alabama tourist board to bring artists from the Deep South state across to Suffolk. This year's line-up also includes Britain’s own folk protest singer Billy Bragg and Minneapolis-based Chastity Brown – familiar to fans of Later…with Jools Holland, on which she appeared last September, performing her single Colorado. Other acts lining up for the eighth Maverick Festival include Case Hardin, The Dreaming Spires, Don Gallardo and The Rosellys. They will take to the Peacock stage on Friday 3rd July for the Rollin’ Revue – six hours of Americana, roots and alt-country curated by Clubhouse Records. Paul McClure’s songwriter’s sofa will also feature special guests Simon Stanley-Ward and Emma Swift. 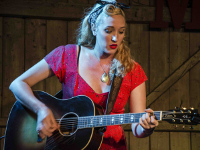 Canadian singer-songwriters Miriam Jones and Amanda Rheaume also join the line-up, alongside New Orleans combo Gal Holiday and the Honky Tonk Revue, UK banjo ace Dan Walsh and fellow picker, yodeller and band leader Curtis Eller, with his American Circus. Alabama’s own Hannah Aldridge, Lisa Mills and Debbie Bond are also set to appear at the event, which features a camp site, bell tent meadow and tipi village, as well as showcasing a selection of local food and drink producers. There will also be a screening of The Other Side of the Mirror, which documents Bob Dylan’s appearances at the Newport Folk Festival, including the notorious 1965 concert when the folk giant ‘went electric’. Veteran producer Joe Boyd, who was responsible for the sound at the festival, will share his recollections and host a question and answer session. Mr Spencer, who is also a music documentary-maker, once had the pleasure of meeting blues legends Solomon Burke and the late great BB King, who died in May. Visit maverickfestival.co.uk for full details and tickets.